Preheat oven to 325 degrees. Spray a 12-cup Bundt pan (a 10-cup pan will be too small) with cooking spray. Beat the butter until it’s creamy, and then add the sugars. Beat in the eggs, one at a time, and then the vanilla. Add the baking powder, salt, and one cup of flour and beat until just combined. Add half the milk and beat until just combined. Alternate adding flour, then the rest of the milk, and then the rest of the flour, mixing each time until just combined. Fold in the toffee bits. Transfer the batter to the Bundt pan and spread evenly. The pan will be pretty full. Bake for 70-85 minutes, or until a toothpick inserted near the middle comes out clean. 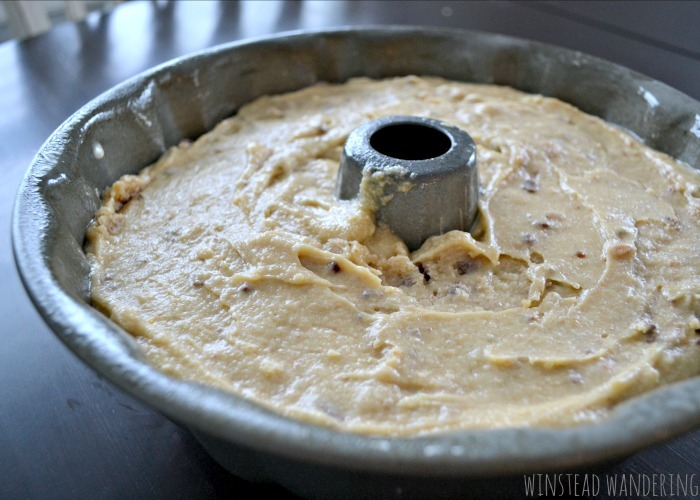 Allow cake to cool for thirty minutes before transferring to a wire rack to cool more. Once cake is removed from pan, prepare the caramel sauce by heating sweetened condensed milk and brown sugar in a saucepan over medium heat. Bring mixture to a boil, whisking constantly. Reduce heat and simmer for five minutes, still whisking constantly. Remove from heat and mix in vanilla and butter. While caramel is hot, spoon it over the cake. You can allow the sauce to cool slightly, but don’t let it cool too much or it will get too thick to spread over the cake. You can use all the caramel on the cake, or you can reserve some to dip fruit in or to serve over ice cream. I used the whole batch on the cake, hence the little caramel pool in the center. What recipe or dish are you always asked to make? Looking for more decadent sweet treats? These peanut butter cup bars are my husband’s favorite, and my cinnamon roll bars couldn’t be easier or more mouthwatering. Thank you! Yes, the icing was very cooperative. And ridiculously delicious. This sounds amazing! I’ve pinned it to try later. Thanks for sharing. Thank you, Lisa! Let me know what you think when you make it! Oh my word! 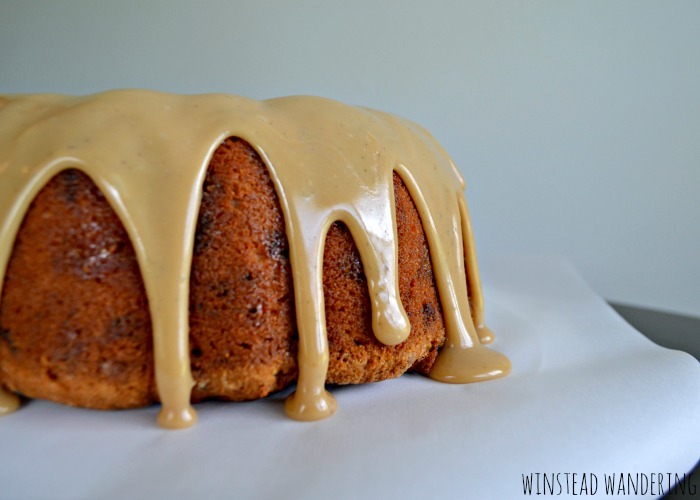 I really need to get a bundt cake pan to make this! My husband would LOVE it! My bundt cake pan was a hand-me-down, but I think it’d definitely be worth the investment! So I try not to make desserts because only my hubby and I are at home and I’m the one with the sweet tooth (meaning that I eat all the desserts by myself). But still, this looks like something worth breaking the rules for. Thanks for sharing. The pictures are amazing! Thank you, Kelsie! This is definitely a rule-breaking-worthy recipe! Try my strategy: I give my baked goods away to coworkers, my kids’ teachers, family, neighbors. Share the love! This looks amazing! I still haven’t gotten the whole baking thing down, but that’s one of my goals when I get a real kitchen! Thanks, Erin! This wouldn’t be a bad starter recipe- nothing too complicated. I hope you give it a try! oh goodness, this looks amazing! Wow this looks like something I would need to take a nap after enjoying! That wouldn’t be a bad choice! 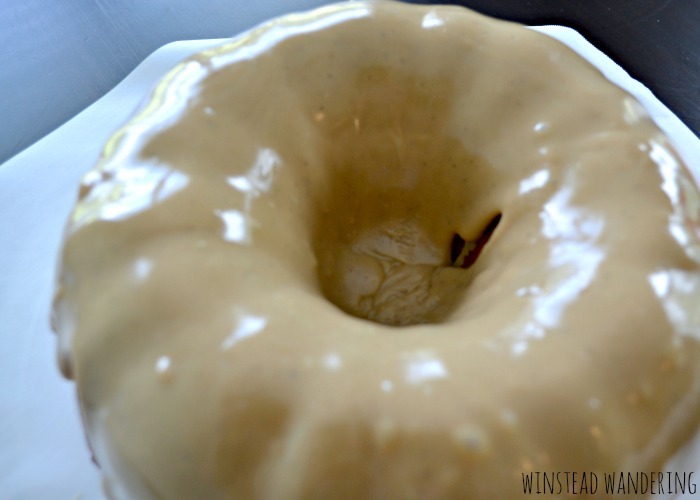 This bundt cake looks fannnn-tastic! 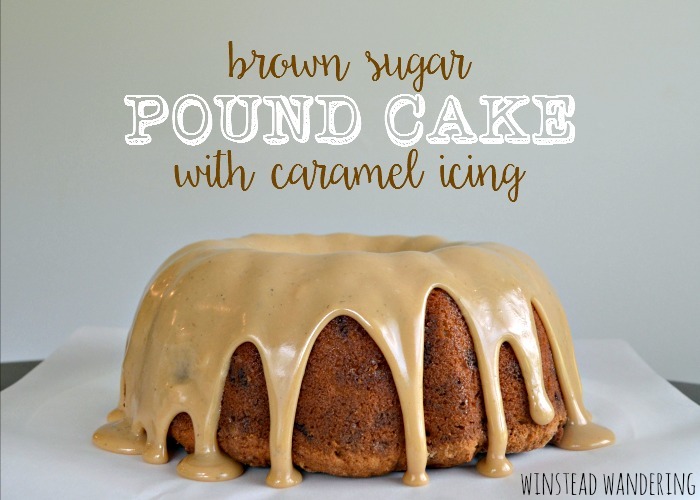 I just can’t stop looking at that dripping caramel icing! This will be my friend’s birthday cake, that’s for sure! Thank you, Linda! The caramel is mesmerizing, isn’t it!? I hope you and your friend love it! This is gorgeous!! My neighbor and I like to try new things and share with each other. I think I will treat her to this! It would be soooo pretty as a Fall dessert, too! Pinning this now! Thanks, Brandy! Caramel is perfect for fall! You have a very lucky neighbor. Thank you! I’ll definitely be there again this week! Hi, Ann! I didn’t find the icing grainy at all. It’s nice and smooth. Please let me know how you like the recipe!